I'm in the final planning stages for a big home remodel of my own this time, and believe it or not it can be so hard for me to allocate the time and attention that this project should surely be getting from me! 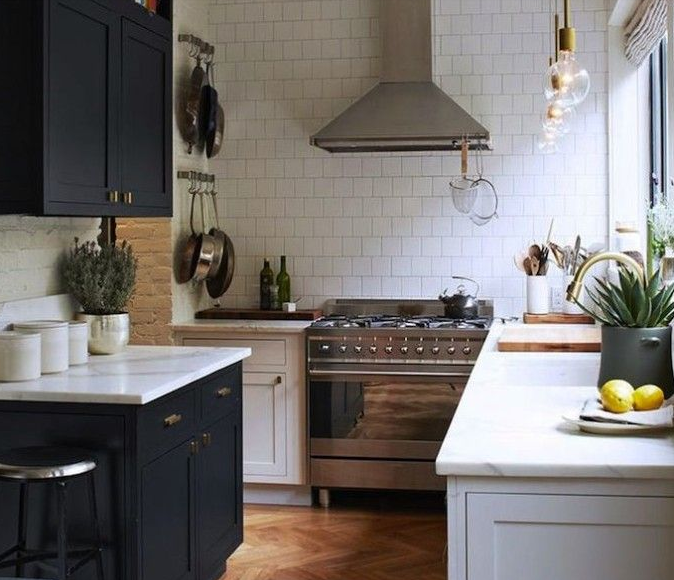 But today I felt like I made some major headway in the kitchen design, and I surprised myself with the realization that I want black cabinetry. Seriously, it came as a shock! I had general ideas about what I wanted (quick recap: the house is a 1923 California Spanish, and we're keeping it fairly traditional with lots of gorgeous updates and just enough edge to feel fresh and exciting.) 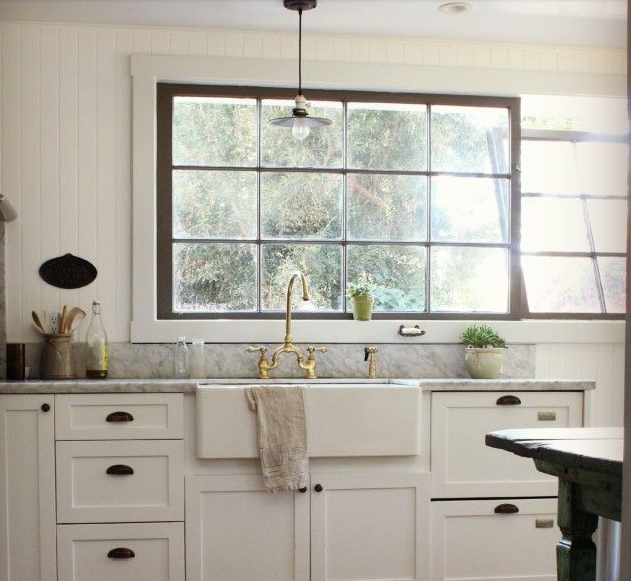 The thought for the kitchen was white cabinetry, carrara marble countertops, white subway tile, wood floors, etc. Keeping it classic. 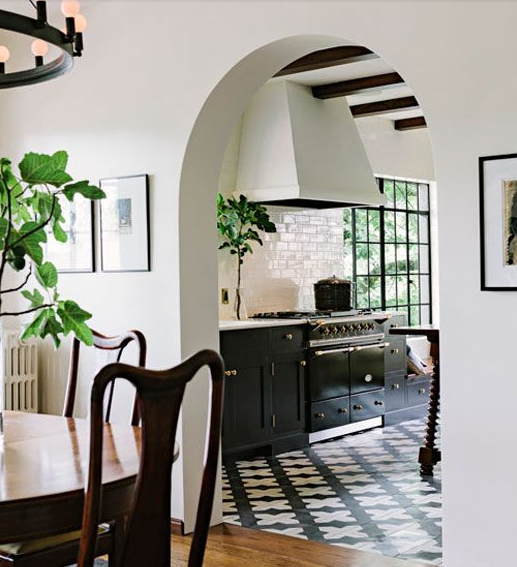 A) We own, due to a fortuitous little mix-up involving a client declining what they'd originally ordered, this existing Aga stove in white and black enamel that makes for a pretty spectacular centerpiece in any kitchen. So we will obviously be designing around this beauty. 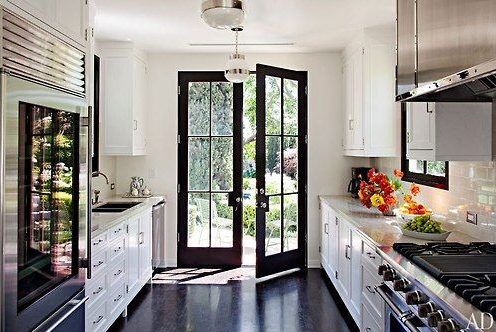 B) We will have double french doors with black trim leading from the kitchen to the back yard. 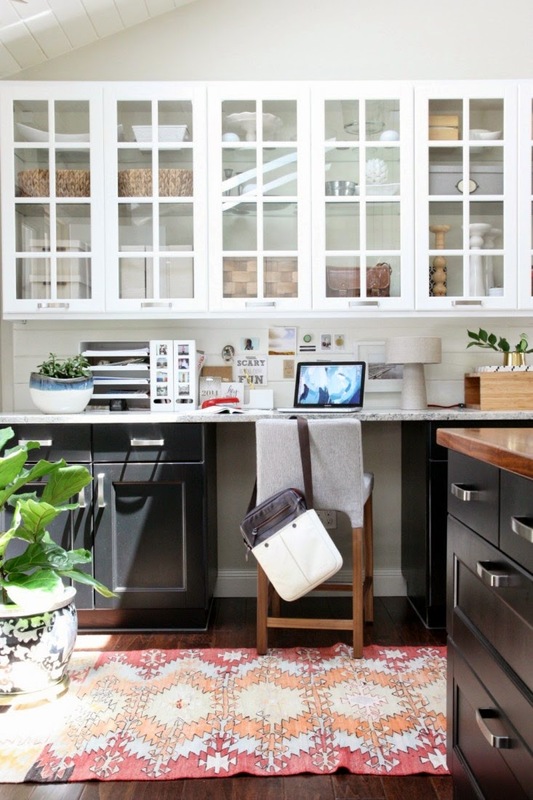 Similar to the image below, although my doors will be on the broad wall of the kitchen and not at the end like this. So this is another major design element to take into account when I'm planning the rest of the kitchen. 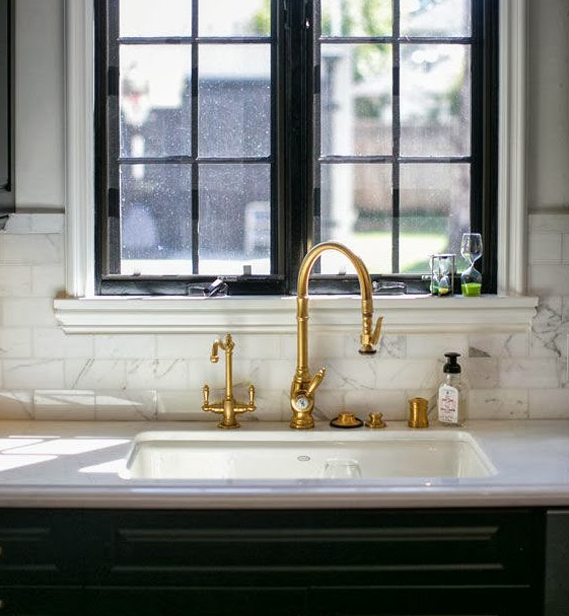 I mined through a ton of Pinterest and Instagram images today which really helped me sharpen my vision of what I do and don't want for this kitchen. I highly recommend using this process for any design challenge you're working through ... it is SO helpful to compare, analyze and dissect many different photos to figure out which elements are drawing you in and which leave you cold. I bet you'll be surprised at what you find out! 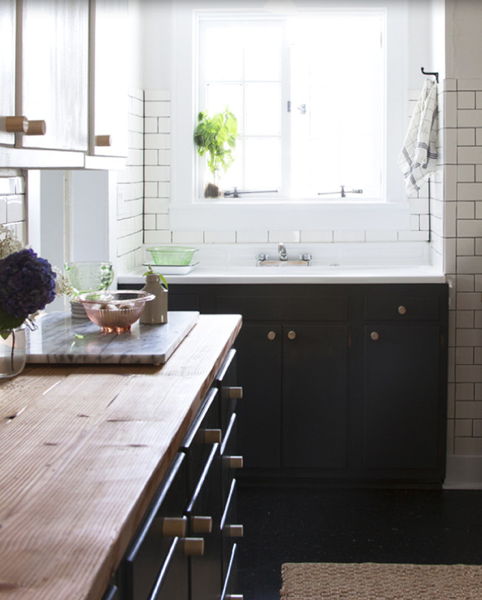 In the course of my research today I learned that I really love the look of black base cabinets in a mostly-white kitchen. 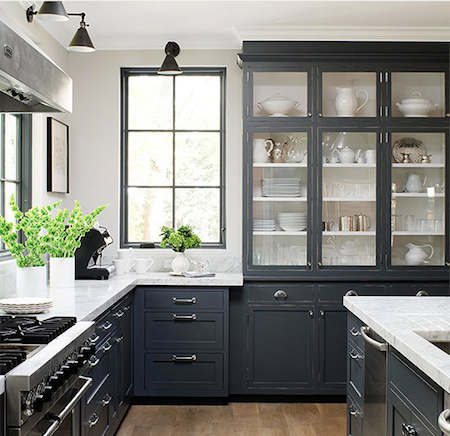 I learned that the exception to my distaste for black wall cabinets is when they are trimmed in black with glass fronts and bright white interiors. 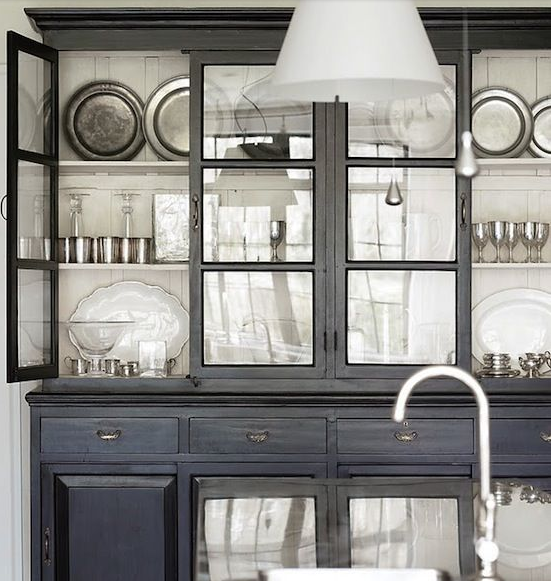 I love that contrast, and since I'm an all-white-dishes kind of gal, this look would totally work for me. 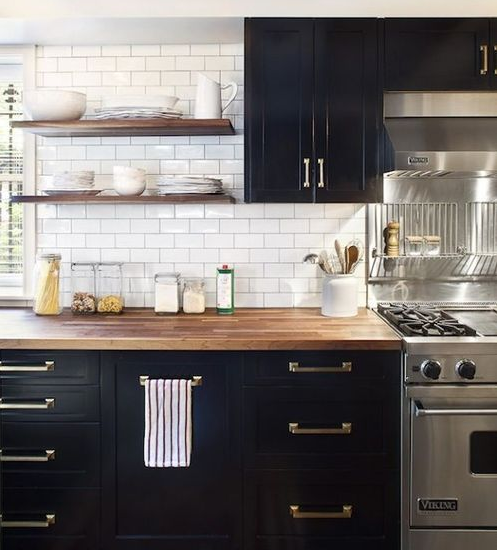 I learned that I myself don't love the combo of butcher block counters with black base cabinets, but that I'd like to incorporate a bit of natural wood (maybe open shelving?) 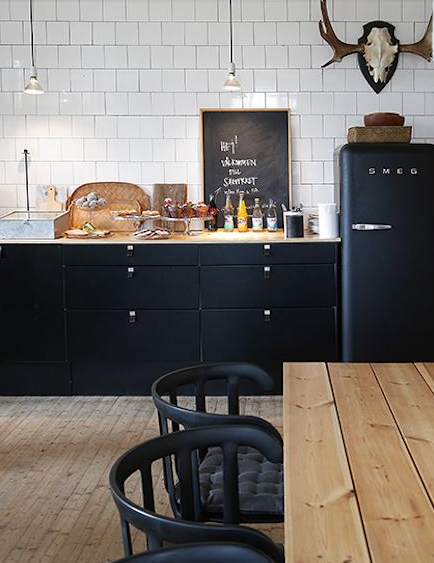 somewhere in the kitchen to keep a casual and organic feel. This is first and foremost a family home and I don't want it feeling too stiff or formal. 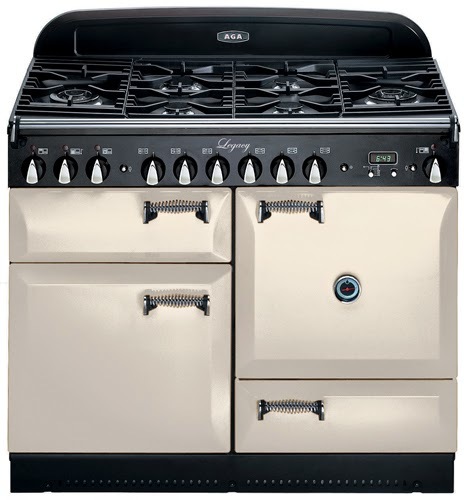 I learned that I'm leaning toward having a white plaster hood over the range rather than the usual stainless steel model. In fact the house below with the arched doorway and white walls has the sort of vibe I'm going after. 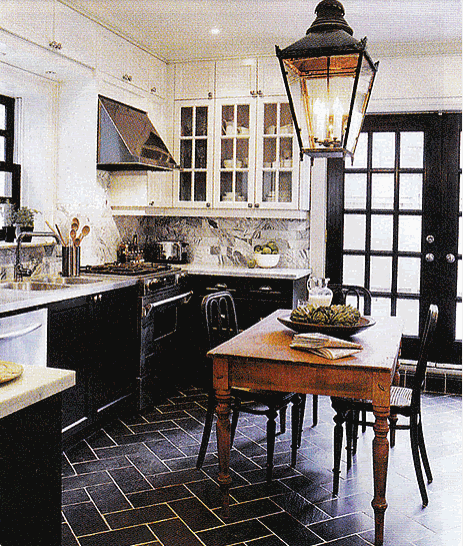 I'm even planning to use cement encaustic floor tiles like these in the mudroom and at least one bathroom. I learned that I still dearly love the combo of black with brass hardware. I'm a tiny bit concerned that this combo will feel like a passing trend a couple years down the road, but I'm tempted to choose a raw, unlacquered brass that would patina and dull over time. In the end you have to go with what you love, even if it means jumping on the trend bandwagon. If you truly love it, you won't tire of it. 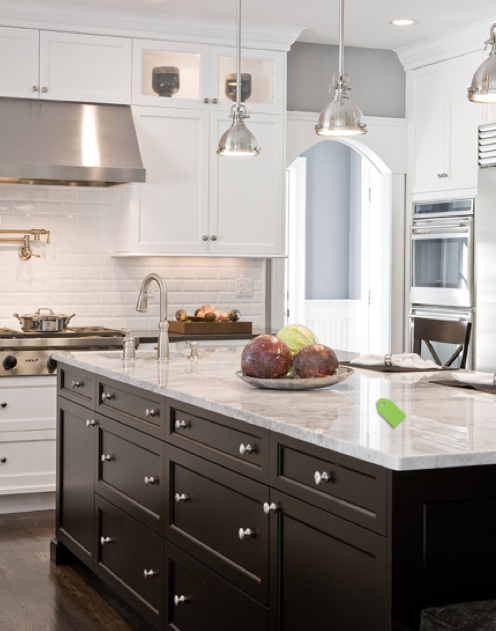 And last but not least, I learned that this style of kitchen I'm describing with black base cabinets and white uppers is called a "tuxedo" kitchen. I didn't know that! So what do you think of the direction I'm headed in? 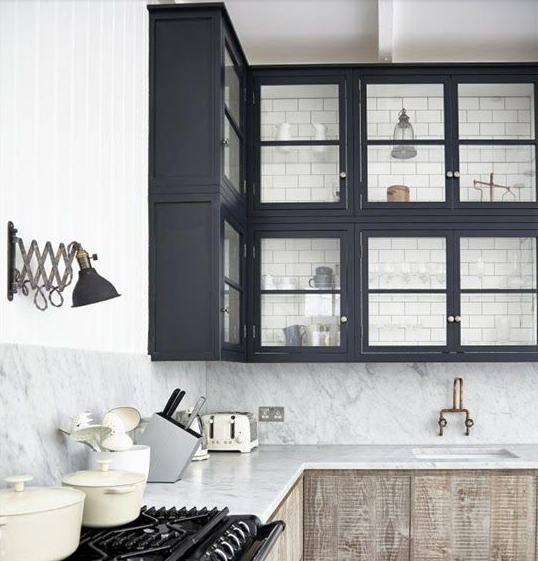 What would YOU do if you could design your dream kitchen? Love it. I also love dark trim windows and doors. 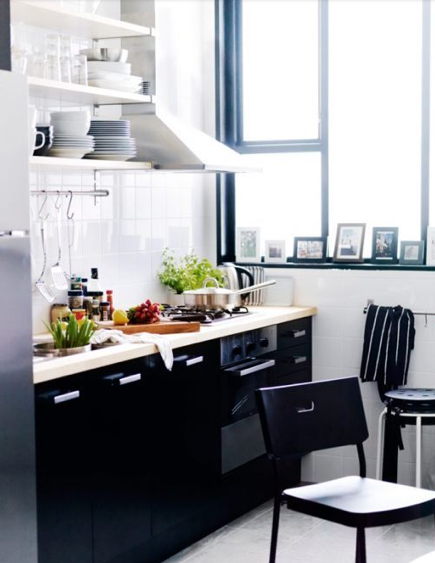 I think a black and white kitchen is perfect for a spanish bungalow! I'm actually in the middle of redoing my kitchen and I have been going back and forth about painting the cabinets black or gray while the upper will stay white and some will be open shelving also. I did the back splash in a white herringbone pattern up to the ceiling. 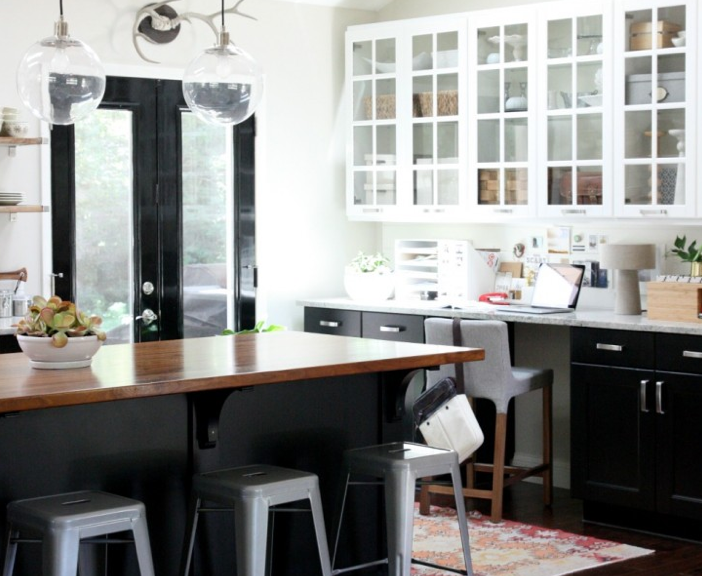 I love the black and am leaning more toward it after seeing your inspiration photos! 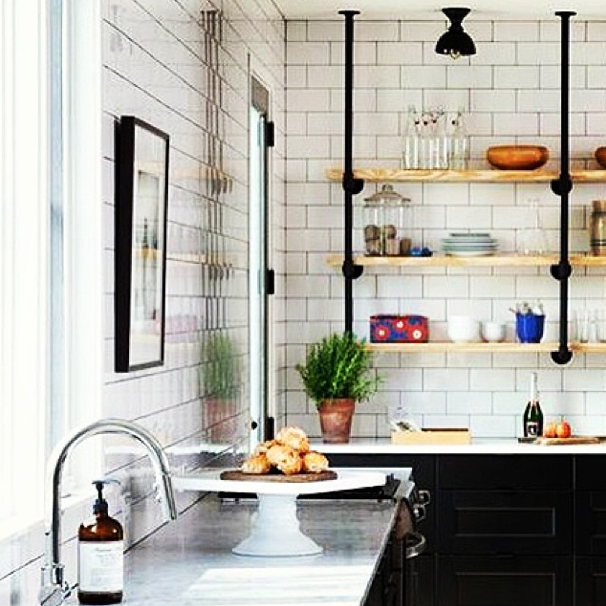 I love the idea of using black in the kitchen! 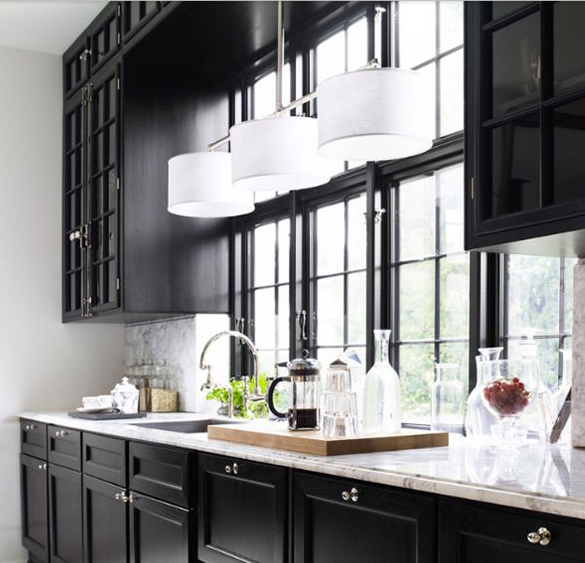 The good thing about black-colored cabinets is that they make the kitchen look modern and classy. And since black is quite a heavy color, it makes contrasting other colors easy, making them stand out and pop. 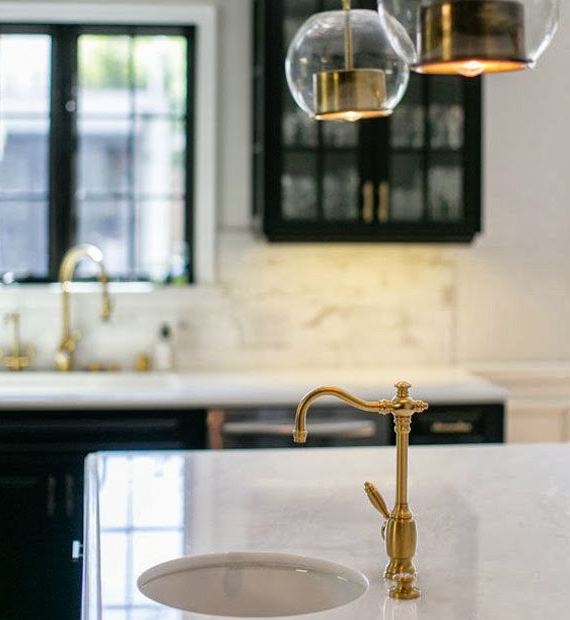 Anyway, I think a gold and black combination is good to give your kitchen a kind of luxurious look. 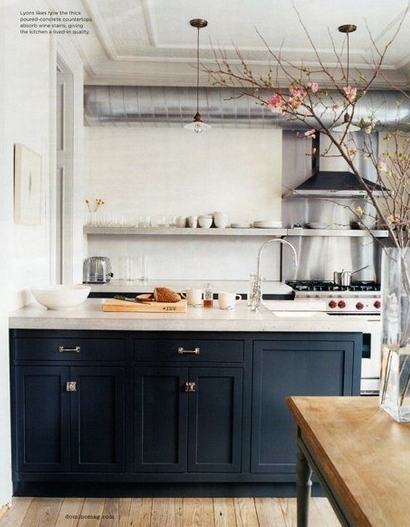 I love these kitchens, you have really set out the fundamental concepts of good kitchen style. thanks for sharing with us. 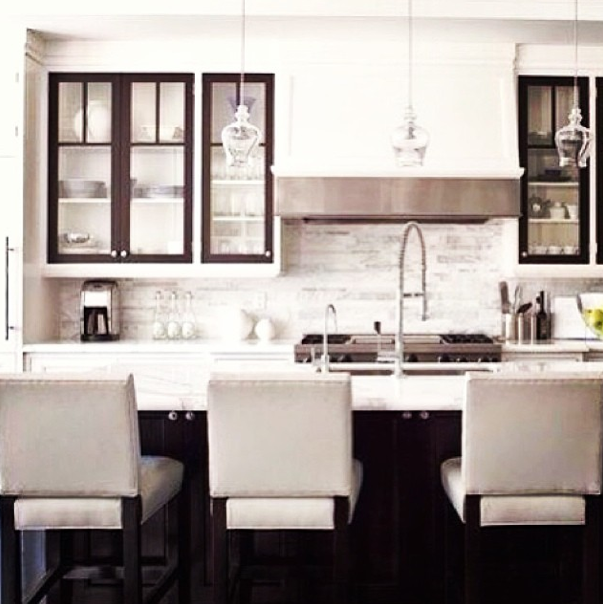 This kitchen is absolutely breathtaking! I love everything about it. I love the lamps, so funky, yet still very stylish. 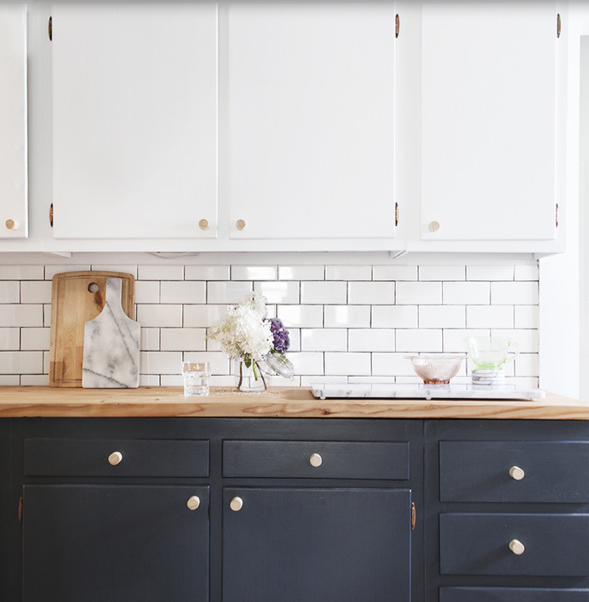 I'm planning a quick home refurbishment next month, so I'd love to use your blog as my inspiration, if you don't mind. Cheers!